Welcome Others Into Your Home. This past month, I have hit a low in my world. It is a battle that I am struggling with and one that has a grip on me. While writing this, I am still working through struggles. The positive about this is, I have been here and come through struggles like this before. I know where to draw my strength and I know how to overcome. 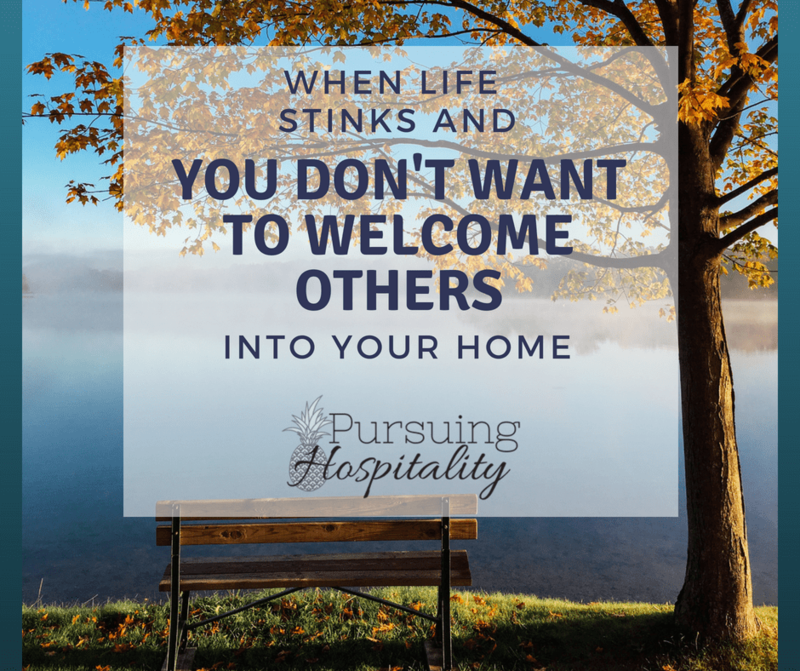 But we all have days when life stinks and you don’t want to welcome others into your home. These days are ok to have, we just don’t need to stay in this place. We need to move forward and find joy in others and by serving others. This past month, a special lady to me went to meet Jesus. She moved her address to heaven sooner than we all expected. It was like a dump truck of rocks had been slammed down on me. My aunt left this world and left a family that loved her dearly. She was one of the pillars in my life. I wasn’t able to attend the funeral because of our son’s graduation and I don’t think I have come to the point of closure yet with it. God is giving me peace as well as starting to understand. But this has put me in a place that I don’t want people even asking about it and in turn, I don’t want them in my home either. My struggle is letting others minister to me. You see, the reason why I really don’t to welcome others into my home, is that I don’t want to have that conversation of, I am so sorry or is there anything I can do? These conversations I remember avoiding when my mom moved to Heaven. I tried with everything in me to avoid those statements. What this caused was me to close myself off from the people that wanted to be in my home and wanted to make sure I was ok. Can you believe that? I am known for the home of hospitality, and even I get to the point I really just want to hang a sign on the door that says, DO NOT ENTER. This is how I feel when life stinks. Through the journey of my mom moving to Heaven, I saw myself slipping into this attitude of not wanting others around. I saw myself secluding myself from friends that deeply loved me. You know the friend that can say, I am so sorry, and you know they are grieving because you are grieving. 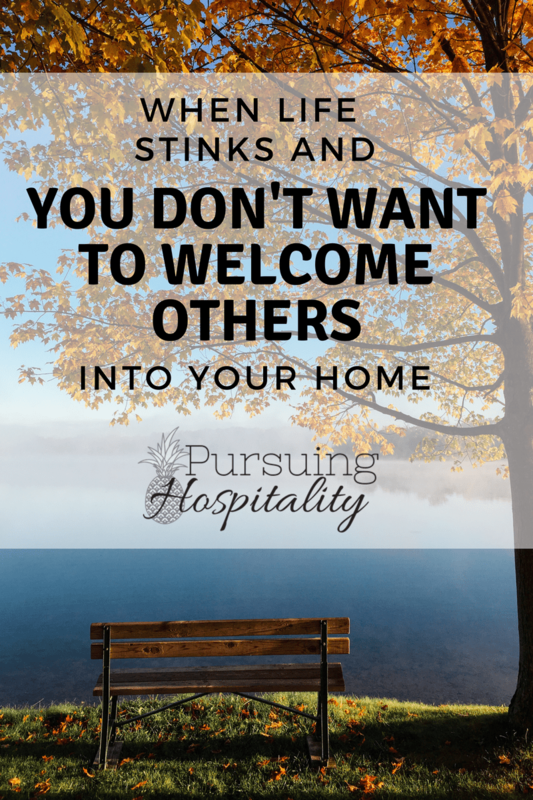 I had to force myself to intentionally welcome others into my home during these times. I had to make an effort to create opportunities that I had people over. It was a chore or a burden to do but I knew for the sake of my sanity, my mental health and my family, I had to intentionally welcome others into my home. Do you have a movie room in your home? Maybe you have a pool in your backyard? Who knows, you have to much chicken in your freezer? These are all questions to ask. What do you have that others enjoy? Did you notice each one of the questions was about something you had at your home? It wasn’t that people love to come and just sit and chat. I am sure they do love to come sit and chat but when life has you down, you want to focus on something to do. So we have a pool in our backyard. People love to come and swim. They also love to come and cookout and have a meal with us around the pool. I am so thankful that summer is here and it has hit during a time that life is pretty stinky for me. The pool gives me an opportunity to invite people over and fellowship with them but not feel like we have to sit for hours and drink coffee and talk about all the problems in the world. Maybe you have a volleyball set you can throw up and invite people over. It will be a fun time together. This is a time for you to get encouragement and still not feel like you are having to lay out your feelings on the table for others to evaluate or even tell you they understand. So, I shared a few ideas on how to open your door and welcome others in, but here are some more ideas that are awesome too! Birthday party for the whole month. This will get several friends together and the focus will be on the ones with birthdays. There is so much you could do and not just feel like you have to sit around a table and chat. After my mom passed, I allowed myself to stay a little bit too long in the self-protection mode. I probably went over 6 months without having someone in my home for me just to sit and have a conversation with. Other than my best friend, my doors were closed to one on one conversations. I had shut myself off and not in a healthy place. I learned through this time that the only way to move forward was to put your focus on serving others. Starting to serve others in a group and then soon after, I went back to the intentional one on one relationships over tea and coffee. We are designed to invest in others. We are made to impact others. Yes, I do think we all need time to heal from a stinky life event but don’t sit long in it. If you do, you will have a hard time climbing out. If your life stinks and you are struggling or know someone that is, take time this week and plan a gathering. Plan something that is outside and fun. Put your attention on inviting people to come and making the plans. Put your focus on serving others and sharing what you have been given with them.